This week’s episode of Off the Vine welcomed Sustainability Manager Robert LaVine, Sean Carroll, and long-time Sonoma County resident and Dry Creek Valley grape grower Mike Rowan. Sustainability takes no breaks for these gentleman! The group discussed the process of sustainability assessments, next generation farming practices and family business. Robert discusses his approach to starting the sustainability conversation with grape growers large and small; often sitting down at kitchen tables to have a conversation. Robert and Mike introduce the CSWA Binder – used it as a door stop or to start a revolution! The binder contains the road map for becoming sustainably certified; a manual that has been developed by passionate grape growers for grape growers, with the help of the Wine Institute. 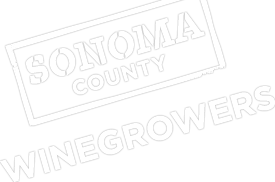 Mike discusses being a part of the Sonoma County Winegrowers Small Grower Pilot Program and his background in farming. Moving to Sonoma County during the late 60’s with his wife and two children times were changing, and the wine industry was just beginning! As a motivated farmer and graduate student at the time, Mike decided to plant his roots in Dry Creek Valley. Today, Mike is only “half” retired, still doing vineyard consulting around the county and sharing his love and the craft of grape growing.